We got wars going down in the middle-western states." —The Hold Steady, "Knuckles"
The video begins — the 17-minute-and-18-second version that's posted on YouTube, anyway — with a medium close-up of a carnival barker carnival-barking at a group of gawkers outside of a freak show. The tape is blurry but the metaphor is clear to the point of obviousness. And yet Edwin Newman, the unflappable veteran reporter carved out of hickory and tweed who has been dispatched by NBC News to get to the bottom of this evening's investigation, isn't afraid to underline it several times. He alludes to P.T. Barnum and the suckers who are born every 60 seconds. He warns against a "vast machinery of hype" threatening to sucker the suckers of today — which in the video is 1977 — into mindless oblivion. Even by the murderously lax standards of the network-news hatchet job, Edwin Newman has dispensed with all subtleties. He is out to bust balls. Hype is this newsman's primary concern. Hype is the subject of his special report, helpfully titled Land of Hype & Glory. Suddenly, the setting shifts to a rock concert, and we meet Newman's Exhibit A. "These four men have been performing for four years. In that time they've been responsible for selling records worth $30 million," he intones grimly. "By some accounts, they are the favorite rock group of American teenagers. Their name, for no reason immediately apparent, is Kiss." Kiss is playing "Black Diamond," the final song on the band's self-titled 1974 debut. "Black Diamond" is sung primarily by drummer Peter Criss, the Catman, but the Catman is the one member who is not in view. Instead, we see Gene Simmons stomp from stage right to stage left like Frankenstein doing the funky-chicken. We whizz by Ace Frehley playing a guitar solo with his Gibson held at a mathematically precise 45-degree angle. We venture to the outskirts of Paul Stanley's black forest of mossy chest hair. 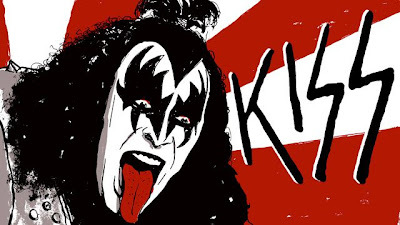 The visual stimuli serve as the backdrop for Newman's brisk overview of Kiss's history — sorry, Kisstory — and performance aesthetic. "From the beginning Kiss emphasized style over substance," he says. "They went heavy on trappings. Makeup came first. It set them apart from everyone else and gave them an aura of mystery … Costumes were next, complete with black leather, aluminum studs, and eight-inch platform heels." Newman talks about Kiss's elaborate staging, which includes a battery of 40 amps and 150 speakers — "more than any other rock band has," he notes — pumping out 130 decibels. ("In technical terms 130 decibels may be described as loud," Newman clarifies.) He estimates that 1.7 million people buy tickets to see Kiss every year. That makes Kiss an incredibly vast hype machine for Newman to explain to the viewers at home. But Newman's studious manner suggests that he is the right 58-year-old person for the job.